I know it might seem odd for me to highly identity with a film about a Central Valley, California teenage girl in high school, struggling with teenage girl issues and her turbulent mother daughter relationship, all of which fails to fit me at all. Yet I did, very much, even if I was the only single male in the theatre. I haven’t written for a while because I honestly haven’t much idea how to anymore. I got back to America and felt rather lost, defeated, and unsure where I might belong; I still feel much this in many ways, but it’s gotten better, as things do in time. To generalise my own experience, I would say there are two sides to this coin. On the one side, when you leave home, odd things come to bring you comfort, such as the sound of a church, the curves of a road, and a bandaged wound for Lady Bird. These odd details of home suddenly take on a life of their own in the familiar vacancy. I found many of these little things around Christmas time last year, and they brought me immense comfort. Yet, on the other side, after you’ve adjusted and those details become mere memories of someone else, someone who lived elsewhere in a different time and a different place, when you’ve grown to appreciate your new ‘home’, then that home (that place you left behind) becomes almost as foreign as the place you initially came to. Naturally then, you return to find yourself more aware of the nuisances and bitter noises that drove you mad before you left in the first place, perhaps the very things that pushed you to leave. On the one side you have Lady Bird, a film about finding comfort and identity with home, so leaving home becomes difficult, even if that home is not a comforting joy; and, on the other side, you have Brooklyn, a film about finding comfort elsewhere when leaving home seems an initial mistake. I haven’t written strictly about any films since I first began writing here, but I feel as though these deserve it. Perhaps I’m simply a fan of Saoirse Ronan (she certainly has a country struggle similar to Eilis) — I’m sure Loving Vincent will be in here someplace as well (if only to justify Van Gogh) — or perhaps it’s a mere coincidence that two films, which strike me on a deep personal level, happen to both be hers. This is regardless, however. As I said, Lady Bird doesn’t reflect who I am very much. I once knew someone from the (central val) area, and having that relation under my skin certainly helped me understand and appreciate the film more. (Thank you for that, if you happen upon this). Yet, overall, I can’t say I share many similarities to Lady Bird, apart from an overly rebellious heart. Though to be honest, of all the coming of age films I’ve seen, this probably resonated with me most. I suppose that’s to say, it’s a brilliant film that achieves just what any film ought to with its audience. (And considering how reviewers feel of it, I’d say this is true.) It’s well acted, well written, well filmed, and truly well framed: Sacramento and its road being opening and closing bookends. This isn’t really a review of anything though, so I’ll move on from here. What the film conversed with me was our personal identity’s need to be grounded. We each have an internal struggle to place our feet somewhere, to sprout out of someplace, to both admit and know ourselves where we are from, where we’ve toiled out of. A teenager (a teenage girl even more so) is the perfect expression of this struggle, as most seem to fight against the acceptance of that placement, wanting something else, something grander and not “the wrong side of the tracks”. And yet, we continue this struggle well past our ‘traumatic’ years of teenage turmoil. I feel my home country (the States) are truly struggling with this currently, trying to forget the racism of the past, to change everything about itself, trying to make something we feel we lost great again. Being in another country when the start of this “teenage crisis” began, I’m honestly utterly lost by it all. That is the result of my distance, I suppose. Though politics and cultural chaos never have been my interest, so I suppose it’s all rather greek to me by nature. And yet, outside of all that, even in our personal characters, I feel we’ve taken our identities for granted much the time, wanted to tear the statues of our past to the ground with a too eager cry. I’ve certainly wanted to forget the past at times — this past year especially — I think we all have. But they’re all we’ve got, even if we’re not proud of some: (for those, I’m sorry, perhaps someday they’ll cease to hurt). I believe, even if our pasts are not the best, what we’ve grown out of, what that bottom identity is, must shape us for the better. Germany is very keen to remembering the Holocaust, lest anyone forget it and repeat its horrors. Belfast seems rather keen on remembering its pubs that saw destruction one too many times, lest someone get the idea to destroy one again. Even if our teenage selves wouldn’t have it initially, I think we must grow up at some point to accept and remember our grounding, lest we trip on its same mistakes. Lady Bird eventually accepts and in a certain way embraces her mom and Sacramento as her home, regardless of any ill memories she might have, or if anyone has any idea where it is on a map. Our identity must be based in some place, must have a past and grounding, both good and bad, both individual and collective. I’m writing to myself as much as anyone else. Eilis seems to have this similar struggle, yet in the opposite direction. She is given a new Brooklyn identity as she sprouts out of her grounded Irish Identity, and so she must come to terms with it, she must see the less favourable aspects of her past home in order to fully embrace her new. She must return in order to remain. For much of this, I believe she is dependent upon people in its term. Her identity, despite the title, is more based around other people, with her sister, her mom, her old boss (who’s horrible), and her eventual husband and American-Italian family. There is so much identity juggling going on and it’s all based around people. Every relationship (friend and otherwise), I’d say, either ends in displacement or in the growth of familial ties. Location can heavily affect this, and perhaps that is where the difference of Ireland and Brooklyn struggle. Most Phoenicians have a heavy slice of the city in their skin and I’m no exception; I’ve found myself drawn to Tacoma (an oddly similar city with a totally altered state) for this very reason. However, I find my identity most heavily rooted in the people closest to me, and that can change in distance. In this, people become our Sacramento, our grounded identity in which we can turn around and say, “That, that is where I’m from, who I’ve formed out of (not merely literal).” Perhaps that is why Marguerite plays the piano so lonesomely as she does: the vacant smell of Van Gough’s paint still haunts his absence. The smell of oils is such a lovely scent, after all. And perhaps a part of her identity feels at loss because of his loss. And this, I suppose, is the flaw in that fielding of self, that it is fragile and bound to falter in its mortal passing, its geographical strain. Eilis must find her identity anew because her sister, her sister who she always compared herself with, always looked up to, always hoped to be like a little, dies. She must see the bitter notes of her Irish home in order to accept who distant Brooklyn home. She must face again in order to embrace anew. Perhaps Lady Bird has a similar matter with her mom, and perhaps that is why she must struggle with her as she does, and must eventually leave. As a Christian, Christ ought to be my firm grounding, my base identity, as He is neither mortal man nor fickle land. As a flawed human, I falter at this and stumble about like a drunkard most the time. Sadly, our pasts often betray this as well, considering how easily one may find a “Christian” who couldn’t care less what Christ taught and stood for and how lazy churches often are in the same regard. Our pasts, our fellow human identities, are generally the filthiest of Judases, I fear. Yet, even Lady Bird, who admittedly avoided further Catholic schooling, found comfort in a church. I think there is a level of homeliness we must find. For Christ, when people say the Spirit drew them, when they reflect on what “brought” them to Jesus, I believe this homeliness is what they mean. There is a homeliness they have found in Christ: not necessarily the Church or other Christians (though this is sometimes the mistaken swapping), but the comforting character and person of Christ. In spite of the crooked human form, in spite of poorly characterised churches, they have found comfort in the actually comfortable home of Christ. We must do this with our Sacramento. We must find this homeliness, this comfort, or else our identity remains homeless. 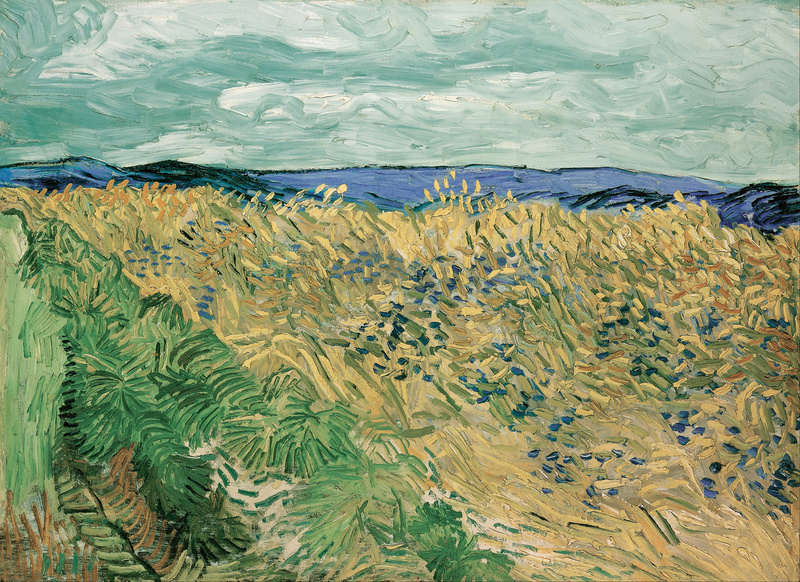 Perhaps Van Gogh returned to those wheat fields because his identity felt homely in it. Perhaps that is why I return to England so wantingly. I fell in love with England, at some point, in some moment, whether by Lewis or elsewhere, and yet like any decent love, it broke my heart. It seems to each time I go; I’m not sure why. It seems the last few years have broken my heart much. By a row of broken hearts, Lady Bird comes to terms with her identity. By a broken bond with her mother, she comes to see the homeliness with her. By leaving home, she finds home. It has been said that courage is the strength to get back up after you’ve fallen; I’ve always been wretched at getting up — being a night owl and all. And yet, it is usually not admitted that courage is sometimes the mere strength to continue crawling, regardless of when you make it back up standing. Sometimes the getting up part is not an immediate option but a slow trek one has to make for a very long time; sometimes crawling, instead of stopping and dying, is getting back up, is standing again. I had a teacher once tell me that we must sometimes hold to Christ with our teeth and nothing more; I think this is commonly true in many regards. I might be terrible at standing and might stumble about, but I can at least crawl a good five thousand miles or so. Lady Bird crawls though most the film, I’d say. Eilis is far better at getting up, though she does stumble about here and there. Van Gogh, in his constant drifting, seemed to struggle in this grasping of home, and it seemed to have betrayed him in a way at the end, falling entirely. With common feelings of irrelevancy and perhaps the occasional unwantedness, I sympathise with him immensely. How firmly we’ve grasped our identities, how well we’ve fit into them, how we have found that homeliness, seems to affect our ability to walk, our ability to stand with a secure footing. It can betray so easily. I suppose part of my identity is in California some place (given my affinity to it), some place in England even. I suppose part of my identity is being the only male in a theatre of women watching a teenage female drama. With how dear film is to me and how dear my female friendships have been to me, I’m perfectly fine with that. There are a thousand pillars to our identities, it would seem, and I am certain that place of home, that Sacramento, can only support them all if we allow it to. Regardless of how much we might something wish to leave it behind, I don’t believe departure is always the best of options, assuming we are still crawling forward. So here are my thoughts, here are my refections, my responses, my attempts at understanding a part of what makes us. I hope they make sense at least a little and aren’t entirely mad. Hopefully you’ll hear from me sooner than later, though I make no promises. Here’s to the Sacramentos that always give us something to both leave and return to. May they ever haunt us and stay near our hearts.